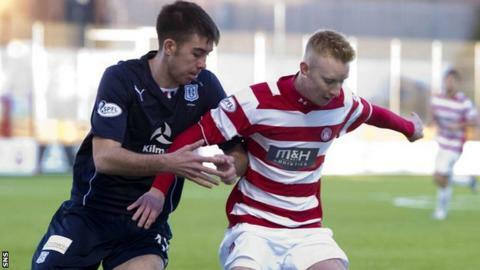 Hamilton Academical and Dundee can barely be separated. They are level on points and goal difference at the top of the Championship, and their meeting at New Douglas Park on Saturday is expected to be tightly contested. No other side has led the league this season, apart from Morton in the opening week and Falkirk one weekend later in the campaign. Hamilton are only top currently because they have scored more goals, yet the club is also the kind of organisation that Dundee want to become. There seems no obvious connection when Dundee deployed a comparatively large budget to chase promotion and are currently owned by a fragile combination of American investors, local Dundee businessmen and supporters. Yet the Dens Park club want to become a centre of excellence for youth development, which is what Hamilton have already established. Outside the top flight, where the likes of Dundee United, Hearts, Hibernian, Motherwell and Aberdeen are running a strategy based around investing in their academies, Hamilton are a model club. In recent seasons, players such as James McCarthy, James McArthur and Brian Easton have come through the ranks at New Douglas Park, while more than half of the current first-team squad were developed by the club. The ethos of the organisation is based upon the principle of being a community club that seeks to attract the best local young talent to develop them so that they fulfil their potential. If Hamilton succeed in returning to the top flight, three years after they were relegated, that approach will not be supplanted by bringing in seasoned players to replace the youthful core of the side. It is a regular part of Alex Neil's weekend routine for the Hamilton manager or his assistant, Frankie McAvoy, to watch the under-16, under-17 and under-20 sides in action, while he also follows the progress of the under-14 and under-15 teams through Allan Maitland, the director of youth development. Neil knows many of the players in the first-team squad because he coached them in the under-17s when he was a player under Billy Reid, his predecessor. "He buys into [the club's strategy], Alex is crucial to the whole thing," says Maitland. "It depends on the dynamics of the football club. Some managers feel the pressure to keep the team in the Premiership. It would be difficult for them to then bring in a 17-year-old when they're struggling to stay in the league. "People are giving Hearts a lot of credit, they have a great system and great kids coming through, but would they have played so many under different circumstances? There's a balance to it. We're comfortable because we know that if we get promoted we'll still use the same model. We'll accept that we're not going to be in the top three, but we want to bring the best kids through and do the best we can in the league." The commitment to youth development does not mean that Hamilton will accept rising and falling between the Premiership and the Championship. The intention is to re-establish the team in the top flight, just without sacrificing the club's fundamental strategy. Hamilton have limited finances, and it takes upwards of £250,000 to fund the academy, but that part of the budget remains ring-fenced. A former manager of Hamilton and Alloa Athletic, Maitland took over as director of youth development from Les Gray two years ago. He has been enthused by the quality of the young players in Scotland, and is adamant that Hamilton's current group at under-14 and under-15 level will soon be pushing for inclusion in the older age groups. Last month, the 13-year-old goalkeeper Joshua Rae moved to Celtic, having already made one appearance for Hamilton's under-20s. The loss of the talented youngster frustrated Maitland, although he accepted that the pull of Celtic was hard to resist for a boy who had grown up as a supporter of the club. Nonetheless, Maitland argues convincingly that the development strategy at New Douglas Park, and the first-team opportunities that are part of the process, serves players just as well. "We're committed to trying to get the best youth policy we can, to have the best players in the area come to Hamilton Accies in the knowledge that they're going to get developed properly and be given a chance," he said. "A lot of people are highly attracted to the Old Firm, the kudos of playing for Rangers and Celtic. But a lot of parents are now having a good look at whether or not there's a proper route for their kids to get into the first team. A lot are looking at Hamilton as an alternative. As far as the academy goes, we're at the top level in Scotland. "I have no doubt the model will stay the same [even if Hamilton are promoted]. It will be the single most important part of the football club. Will it be sustainable as far as competing in the Premiership? Because we would be a Premiership club I would hope we could attract better kids. "Everybody has bought into the ethos. Of course, the first-team needs to be doing well, but the youth academy is the backbone of the club." There are challenges to overcome against Dundee, though, since Hamilton have not scored against them this season, or against Alloa when current Dens Park boss Paul Hartley was manager at the Wasps. Both sides will have four games remaining after their clash, and three are against the same teams, Dumbarton, Alloa and Morton. They are tightly bound together at the top of the Championship, and have the same immediate aims, but it is Hamilton who have established themselves as a club that is accomplished at developing young talent, which is the long-term ambition of Dundee's American investors.